Java provides versatile technologies for data access and manipulation. This book investigates these technologies in detail and shows how they can be used to develop robust enterprise applications. The book is divided into five sections, the first of which looks at data and object modeling. The second section investigates accessing data in relational and object oriented databases, and directory services. The focus of the following section is data presentation for web clients. The fourth section covers Enterprise JavaBeans and distributed applications. The last section of the book consists of four real-world case studies that build on the previous chapters of the book. Transactions, performance, and scalability of data applications are also discussed throughout the book. 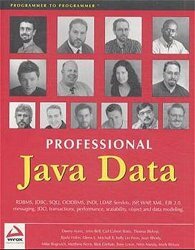 Category: Best Java Books Java Servlets Books Tags: Java Servlets, Java Tutorials, Peer Information Inc.